(Nanowerk Spotlight) Nanoparticles can deliver different types of drugs to specific cell types, for example, chemotherapy to cancer cells. But for all the benefits they offer and to get to where they need to go and deliver the needed drug, nanoparticles must outsmart the body's defenses so that they don't recognize them as intruders. That the defenses of the body's immune system tend to destroy synthetic nanoparticles is a major barrier to the use of nanotechnology in medicine. Systemically administered nanoparticles are captured and removed from the body within few minutes. However, by 'cloaking' the nanoparticles with cell membranes, for instance by disguising nanoparticles as red blood cells, they often can survive for hours unharmed. This has led to the development of a new class of biomimetic nanoparticles that combine the advantages of both natural and artificial nanomaterials. These cell membrane-coated nanoparticles are characterized by a synthetic nanoparticulate core cloaked by a layer of natural cell membrane. Cell membrane coating is a platform technology that presents a facile top-down method for designing nanocarriers with surfaces that directly replicate the highly complex functionalities necessary for effective biointerfacing. Cell membrane-coated nanoparticles inherently mimic the properties of the source cells from which their membrane is derived, bestowing a wide range of functions such as long circulation and disease-relevant targeting. In a review in Advanced Materials ("Cell Membrane Coating Nanotechnology"), scientists from University of California San Diego provide a comprehensive overview of this new technology, from its initial development to the current state of the art. In their article, the authors place specific emphasis on the different types of membrane coatings currently employed, along with their special features. They cover these coatings' advantages for specific applications in depth, including some applications that uniquely benefit from the presence of biological membranes. Cell membranes are composed of a mixture of lipids, proteins, and carbohydrates. Lipids are largely responsible for the bilayer structure and fluidity of the membrane, while also playing a role in signaling. Proteins, either transmembrane or membrane-anchored, and carbohydrates are responsible for providing the interfacing functionalities of the membrane. The cell membrane coating technology was first reported in 2011 (PNAS, "Erythrocyte membrane-camouflaged polymeric nanoparticles as a biomimetic delivery platform"), in which researchers directly leveraged entire cell membranes as a material for nanoparticle coating. This concept was first demonstrated using red blood cells (RBCs) as the source of membrane material (Nature, "Nanoparticle biointerfacing by platelet membrane cloaking"). RBCs, which are responsible for oxygen delivery within the body, are known to have a lifespan of up to four months in humans. The ability of these cells to circulate for extended periods of time is a highly desirable property for nanoparticle drug delivery. The RBC-coated nanoparticle became the first cell membrane-coated system reported, and it is currently the most well-studied in the field. The rapid expansion of this platform is partially due to the ease of cell collection and lack of intracellular organelles, which make membrane collection simple and scalable for efficient manufacturing. In addition, RBC-coated nanoparticles have the clearest path toward translation, as blood transfusions are common, and there is the potential to use type-matched RBCs as membrane sources to maximize biocompatibility for wide clinical use. 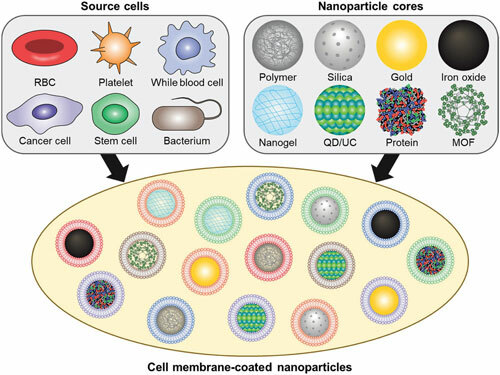 With the success of RBC-coated nanoparticles, other types of blood cells with unique functionalities have also been investigated as membrane sources. One important cell type that has been explored is platelets, which are nuclear fragments from megakaryocytes. The main function of platelets is maintaining hemostasis, as they are naturally recruited to sites of vascular injury to trigger a cascade that leads to clot formation, starting the healing process. Additionally, platelets have various other functions and have been implicated in the pathogenesis of a variety of diseases, ranging from cancer and atherosclerosis to bacterial infections. Like the immunomodulatory markers on RBCs, these disease-relevant platelet functions are largely a consequence of their surface marker expression, which can be transferred onto nanoparticles via membrane coatings. Membrane derived from white blood cells (WBCs), the last major category of blood cells, has also recently been used for nanoparticle coating. Leukocytes help to carry out immune functions and consist of many different subsets, including macrophages, dendritic cells, B cells, T cells, neutrophils, and others. Compared with RBCs or platelets, WBCs are nucleated and have more complex intracellular components, which necessitates more complicated workflows for obtaining their membranes. However, WBCs have unique properties that enable site-specific targeting, especially to tumors or vascular abnormalities, and thus their membrane can carry exceptional utility that makes their use worthwhile. Moving beyond cells originating solely from the blood, another major source of membrane can be malignant cells in general. Aberrant cells have many attributes that make them well-suited for use with the cell membrane coating technology. Because of their robustness, it is easy to culture them in vitro and obtain their membrane material. There are also unique properties exhibited by cancer cells, such as the ability to self-target, which can be leveraged for cancer drug delivery and imaging purposes, as well as antigenic display, which can be taken advantage of for immune modulation. Stem cells are another class of cells that have been leveraged to make membrane coatings. The cells themselves have been widely explored for various therapeutic purposes, especially in the field of regenerative medicine. They are relatively easy to work with, as techniques for their large-scale culture are widely reported. Stem cells display many special properties, including tumortropism, which researchers have taken advantage of to deliver therapeutic payloads. Likewise, coating the membrane of stem cells onto nanoparticles has enabled the fabrication of nanocarriers with similar targeting functionality. In addition to these major groups of membrane-coatings, researchers also are exploring and working on other types of membrane-coatings: endothelial cells, beta cells, bacterial cells, and hybrid cell membranes. "The utility of the cell membrane coating approach will undoubtedly expand as time progresses," the authors conclude. "Ultimately, as this emerging biomimetic nanotechnology begins to mature, attempts will be made in earnest to translate such platforms to the clinic, where they are primed to make a positive impact on human health."